Just ten minutes from Orvieto's town centre, in an old Etruscan area, there is this wonderful luxury estate used as a hotel for sale, the ideal place for pleasant stays surrounded by the Umbrian countryside. This 12th-century Benedictine abbey is called the most ancient hotel in Italy, measures approximately 3,500 m2 and is home to eighteen bedrooms and nine suites overlooking this old abbey's courtyard and hills full of olive trees and grape vines. This magnificent historical estate is an ideal venue for private events and ceremonies; it was once a place for praying and where saints and prelates used to stay and it now offers, thanks to some careful restoration works, all the conveniences found in a modern and top-level tourist accommodation facility. Its twenty-seven bedrooms have different features and peculiarities and are furnished in a classical style with period pieces. The five suites are perfect for a luxurious stay in the Umbrian countryside, offering spacious living rooms with a sofa and armchairs, one or two big bedrooms, some of which also have a jacuzzi and all the conveniences and technology you may wish for. The windows of each suite offer a stunning view of Orvieto or its enchanting countryside. This wonderful luxury property on Umbrian hills is completed by a fantastic swimming pool and a tennis court. Orvieto, in the province of Terni is a charming Umbrian town with a population of 20,000, it stands on a tuff cliff with spectacular overhang walls, a truly unique feature that attracts the big number of visitors coming here to discover this calm and untouched region, an ideal destination to relax and have fun. This area's history is rich and fascinating, and still features the traces of centuries of events that have left a sign not only on its looks, but also in its traditions. 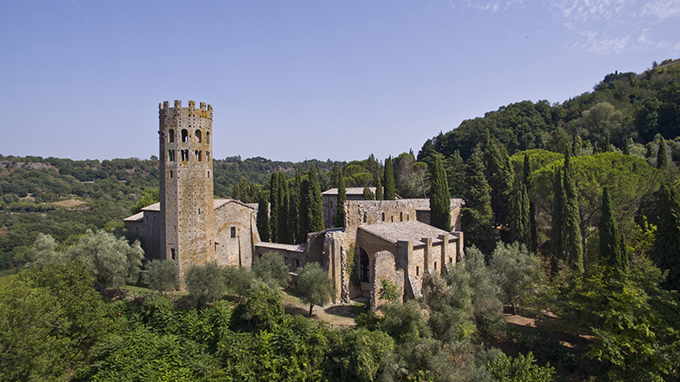 The magnificent Torre del Moro, a Medieval masterpiece in the town centre, offers an extraordinary view over the surroundings, which are made of a pleasant mix of valleys and hills. This landscape is also home to wonderful luxury properties, villas and castle, rustic farmhouses and farmsteads surrounded by nature, in places where there were once Roman and Etruscan villages. This wonderful and prestigious luxury property surrounded by the Umbrian countryside is for sale. Restructured farmhouse villa situated in a beautifully panoramic position among hills in the province of Perugia. In the beautiful Umbrian countryside there is this outstanding luxury property for sale. Luxury villa for sale in the hills of Perugia, with panoramic views of the surroundings. The villa - castle of prestige has an area of ​​3120m2 and has over 6 hectares of parkland and various outbuildings.